In the mid-2000s I was editor of the Alumni Newsletter at the School of Physics, University of Sydney. I researched and wrote articles, typeset, edited and designed a dozen or so editions of the newsletter, which went out to several thousand present and past students and staff of the School, as well as a few thousand more alumni of the renowned International Science School. Over five years I wrote articles on topics as diverse as brain dynamics, adaptive optics in telescopes, nuclear fusion, and solar cells made from blueberry juice. You can see a selection of articles I wrote for the newsletter here (PDF). Article written for the University of York's Astrocampus newsletter in 2016, celebrating the educational facility's anniversary. I made a video about this subject as well, embedded after the article. With a dish* of incredible new telescopes under construction — from the SKA in Australia and Africa to the James Webb Space Telescope — the era of Big Astronomy is upon us. Yet with so many options open to students, and so many mysteries and problems to solve down here on earth, it’s worth asking: why have an Astrocampus, or a Cosmodome? Why do astronomy at all? For one thing, it’s a “gateway drug” for all sciences: you draw students in with cosmic wonder and then segue to other disciplines. Modern astronomy involves physics, mathematics, chemistry, biology, geology, some serious computer science — and if you include human space exploration, then add medicine, psychology and nutrition — all overlapping and cross-pollinating. Here’s an example. Since the first was discovered in 1988, more than 2000 exoplanets have been observed around distant stars, with thousands more awaiting confirmation. Now, exoplanets are very hard to spot directly, so astronomers observe the star itself, watching for changes in brightness, speed or position due to an exoplanet’s orbit. Some very precise and clever physics translates these dips and wiggles into the planet’s mass and orbital radius. But there’s great chemistry here too. Astronomers use spectroscopy — measuring the intensity of different frequencies of light — to learn which planets are barren, rocky lumps, and which are crusted with ice or blanketed by an atmosphere. Enter the biologists. If you can see a planet’s composition, maybe you can spot some basic building blocks of life: oxygen, water, carbon dioxide, methane and other “biosignature” gases. Fuelled by exoplanet data, astrobiology is heating up. Then there are the great spin-offs for society from astronomical research, like CCDs, distributed computing and GPS. And WiFi, for which radio astronomers at Australia’s CSIRO hold some crucial patents through their research. So far they have extracted hundreds of millions of dollars from major IT companies like Intel and Microsoft that use wireless internet standards. While it’s a valid argument, clearly funding astronomy isn’t an efficient R&D process to bring new IT technologies to market. As Carl Sagan allegedly remarked, "You don't need to go to Mars to cure cancer." So we’re left with one very simple and honest reason why we do astronomy: awe. Comedian Eddie Izzard once joked about the overuse of awesome to describe everything in life. As in, "Hey, try these awesome hotdogs". The thing is, words have meanings. If awesome can describe a hotdog, what’s left when you encounter something that inspires actual, real, honest-to-goodness awe? Here’s a test. Look at the picture above of the Andromeda galaxy that NASA took last year. The resolution is so good you can see hundreds of millions of individual stars — yes, stars in another galaxy. You can check out the full-resolution image at NASA's Hubble Telescope website, and I really recommend you do that: go have a zoom around to see just how much detail Hubble captured in that picture. Now: look again. Between those stars you can also make out other, more distant, entire galaxies behind Andromeda. Take a moment to take all that in. Do you feel it? A tingling sensation in your brain? That feeling is why we gape at the night sky, why we watch Brian Cox and Maggie Aderin-Pocock on TV. It’s why we have the European Space Agency and NASA. It’s why we, as a species, are compelled to do astronomy. Because the more we study the universe, the more we find that is truly — literally — awesome. * I’m proposing dish as the collective noun for telescopes. Got a better one? CHEKOV (LOOKING WORRIED): Keptin, you’d better take a look at this. SPOCK: Interesting. If I’m not mistaken, Captain, that is the Starship Enterprise. KIRK: Spock … I thought we were the Starship Enterprise. SPOCK: Yes, Captain. We are. UHURA: They seem to be hailing us! KIRK: My … God! I seem to be … talking … to myself! But … how … can that be? SCOTTIE: Jim! They’r-rr-e beaming aboar-rr-d! SPOCK: Captain, it is imperative that we stop them. 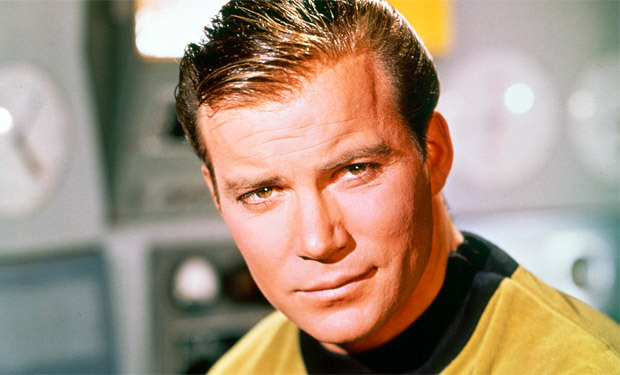 KIRK: Spock, but … why? SPOCK: I believe we have found … the anti-Kirk. Spock, being quite astute about such things, knows that if Kirk were to meet anti-Kirk, they would annihilate in a massive explosion of high-energy photons. A classic sci-fi plot device. Except, we’re not making this up — antimatter does exist. Not only that, it is produced routinely in particle accelerators around the world. The elementary particles that make up the Universe all have corresponding anti-particles — to name the most familiar, the electron has an anti-electron, ad the proton has an anti-proton. Anti-particles are identical to particles except they have the opposite electric charge. And, as Spock knew, if particle meets anti-particle, they spontaneously annihilate, their masses becoming a burst of energy. At the birth of the Universe in the Big Bang when all matter was created, an equal amount of anti-matter also came into existence — the laws of physics dictate that this must be the case. A deep mystery to be solved, then, is this: why are we, our world, our Galaxy, everything we can see in the Universe, made only of out of matter? The Earth is bombarded constantly by elementary particles from the galaxy and beyond. They’re all particles, not anti-particles. Nowhere in the Universe do we see great walls of annihilation as galaxies meet anti-galaxies. It seems everywhere we look, the only stable stuff we see is matter. If the universe initially contained equal amounts of matter and anti-matter, then … where did all the anti-stuff go? The famous Russian physicist Andre Sakharov (winner of both the Lenin Prize for creating the Hydrogen Bomb and the Nobel Peace Prize) proposed a solution to this puzzle. Almost every law of physics treats matter exactly the same as anti-matter — an electron and a proton make a Hydrogen atom in exactly the same way that an anti-electron and an anti-proton make an atom of anti-Hydrogen. But in a remote mathematical corner of theoretical particle physics sits a matrix (as opposed to THE Matrix, which is quite different) known as the Cabbibo-Kobayashi-Maskawa Matrix. It governs the relative strengths of different types of radioactive decay. As it happens, the CKM matrix shows that some of these decays favour the production of matter over anti-matter — but only to a very slight degree. For every billion anti-particles produced from radioactive decays, a billion plus one particles are created. How could such a tiny surplus of matter over antimatter make any difference? Shortly after the Big Bang, the Universe was a seething broth of equal-parts matter and anti-matter. Particles collided with anti-particles and annihilated each other out of existence. As the Universe cooled, the laws of physics that drive radioactive decays were producing just that tiny bit more matter than anti-matter. The annihilation continued unabated, and quickly all the anti-particles and almost all the particles destroyed each other. In the final count, just that one-part-in-a-billion surplus of matter particles was left. Which means that everything we see around us is made up of that tiny excess of matter. If it weren’t for this very small imbalance in the laws of Nature, nothing would exist in the universe but a sea of wandering photons. Today, the Enterprise narrowly avoided catastrophe. My anti-self, seeking to … destroy us both in a … fireball … of heat and light, attempted to beam aboard. Fortunately, at the last minute, I was … saved — a minor actor, with very little character development and wearing a red shirt, tripped and fell onto the … transporter platform … just as the anti-Kirk materialised. They were both … instantly … destroyed. Mental note: must notify the recruitment office in the morning. One of the greatest pleasures of a canoe trip in northern Ontario is to quietly steal away from the evening campfire and set oneself adrift, lie in the bottom of your canoe and gaze into the pristine night sky. If the moon is below the horizon, you see the arc of our own Milky Way galaxy. The sheer number of stars can be overwhelming. There are perhaps a hundred billion stars in our rather typical galaxy. And there are a trillion or so galaxies. So, if you do the math ... that's a lot of stars! To imagine how many, think of all the grains of sand on all the beaches on earth. Yes, that’s a lot of stuff — but to Astronomers and Cosmologists, it’s not enough. Many astronomical observations suggest that we can only see a fraction, perhaps just ten percent, of the matter in the Universe. The rest is invisible. Hidden. Ephemeral. We have convincing evidence it’s there, we just don't know where: it’s dark. For this reason it's been called ‘Shadow’, ‘Missing’, or 'Dark' Matter. Where do you get evidence for something you can’t see? You look for its effect on the stuff you can see. Though it may seem pretty quiet in the night sky, every single star, every galaxy and every nebula, is moving. Their motion is governed by a single physical law, the law of Gravity, that says every bit of matter attracts every other bit of matter. The way stars and galaxies move depends on the gravitational forces from other stars and other galaxies, as well as any other matter that may be lying about. You probably have a mental image of our Milky Way Galaxy, a bit like a great stellar swirl, a pinwheel of light. Surrounding the swirl, though, is a giant halo of stars. Astronomers have measured the speed of the stars in this halo, and to their surprise, they find they’re going too fast. Adding up all the mass in all the stars in our galaxy can not create enough gravitational force to explain the high speed of those stars. On a larger scale, our galaxy itself is also moving. Galaxies are not spread uniformly throughout the universe; they tend to clump together in bigger groups called clusters. Our galaxy is just one of many in our local cluster, known as 'The Local Cluster'. I know. Not a terribly creative bunch, these astronomers. Anyway. In the 1980s, researchers were amazed to discover that between the clusters of galaxies are enormous bubble-like areas of nothingness, great voids where no galaxies exist at all. The galaxies within a cluster are all orbiting each other, and if their speed is measured, once again they seem to be going way too fast for the amount of matter nearby. Now, all this is related to the ultimate fate of the universe. At the current time, almost fourteen billion years after the Big Bang, the universe is still expanding and all the galaxies (or clusters of galaxies) are rushing away from each other. Now, the force of gravity slows this expansion down, and there are three possible fates for the universe. First, if there was an enormous amount of matter in the universe, after the initial expansion everything would collapse back in on itself: The Big Bang followed by The Big Crunch. Conversely, if there was only a little matter, the universe would continue expanding forever. The final result would be a dilute, rather uninteresting universe. Given with the amount of luminous matter (stuff we can see) in the cosmos, we’d expect the latter scenario. But upon measuring the expansion rate of the universe, we find ourselves precariously perched between cataclysmic collapse and a runaway expansion towards a cold, desolate cosmic darkness. Even at this largest of scales, once again we find evidence for missing matter. So what is it, this mysterious hidden stuff? That's just it: we don't know. It could be that the universe is filled with ‘failed’ stars that just weren’t massive enough to light up. Or maybe neutrino mass is the answer. Neutrinos, those ghostly particles that are constantly streaming out of the sun, were also produced in huge quantities in the Big Bang. If neutrinos have mass — an open possibility at this point — then all that extra matter might solve the problem. For many physicists, the smart money is on a quite exotic suggestion: that galaxies could be shadowed by a strange form of matter that is only perceptible to us though gravity. This 'shadow matter' would tend to clump where our galaxies clump, because of the gravitational attraction with ordinary matter. Such strange ideas have been suggested by modern theories of particle physics. Which leads to the rather haunting possibility that the eventual fate of the universe is controlled by the stuff of ghosts. What would you say if I told you we could travel through time? Politely, I’m sure, you would recommend a few deep breaths, and maybe suggest I check the proper dosage on my medication next time. Well, it’s true: we’re all time travellers. We travel through time from our birth to our death, a century our so later. To which you’d probably reply: That’s cheating. Light took nine years to travel from that star to our eyes. So really, you’re looking at the star the way it was nine years ago. And, your response would be: That’s still cheating. Now go away and leave me alone. It’s quite an amazing thought, though. Wherever you gaze, you’re not just looking out into space, you’re also looking back in time. The greater the distance to a star, the longer light has taken to travel across the intervening cosmos to reach your eyes, and so the longer ago it must have begun the journey. Some of the farthest objects ever discovered are billions of light-years away—which means we are seeing them now as they looked billions of years ago! In fact, even now we can ‘see’ the faint glow of the entire universe as it looked shortly after the Big Bang. There is another way to travel in time, but it takes a little more effort than gaping up at the stars — so I’ll need your help. Here’s what we’ll do: find a couple of stopwatches and very fast rocket ship. Start the stopwatches together, keep one for yourself, while I take the other and climb aboard the rocket. I punch in the coordinates for a round-trip to Sirius, set the cruise-control close to the speed of light (say, nine-tenths), and wave farewell as I zoom off into the void. At this speed, roughly 270,000 kilometres a second, I hurtle across space, reaching the star in about ten years, where I then turn around and take another ten years to return. By the time I get back, you’re twenty years older, and probably getting just a bit tired of waiting. When I step down from my trusty spacecraft, something strikes you as odd: I don’t seem to have aged nearly as much as you have. When we compare our stopwatches, yours says it took twenty years for me to complete the trip. My watch, astoundingly, measures a time of just over eight years. How is this possible? You think maybe the watches are defective — except I certainly haven’t aged as much as you have. Maybe I’m just blessed with a young complexion. The answer to this conundrum lies in a physical theory known as Special Relativity. Albert Einstein’s famous work, first announced to the world in 1905, leads to some very strange conclusions about our universe. It turns our everyday notions of time and space on their heads. Before Einstein, people could change where they were, but could do nothing about when they were. Most people thought of time as a river, carrying us all inexorably to the future. Time was immutable. So was distance. If you and I each measure the length of an object, surely we expect to get the same result. Special Relativity says this is true as long as we are standing still next to each other — but as soon as one of us is moving with respect to the other, we will measure different lengths. The faster our relative speed, the less we will agree on the distance between two points. So when I launch off at high speed, you and I measure different distances for the journey to Sirius. To you standing on the Earth, the distance is nine light-years. But for me, travelling at close to speed of light, Sirius is just a bit over three and a half light-years away. In relativity-speak, this is known as ‘length-contraction’. If you could watch my clock as I speed away, you would notice it running slower than yours. In fact, to you, my heart rate would seem slower too, as would my breathing, my hair growth, everything! Though it all feels normal to me, to you my world would seem to be running slow. Relativity says that time, too, changes with speed—the faster I go, the slower my time seems to you, an effect called ‘time-dilation’. While it may sound like science fiction, these effects of relativity are real, and are routinely observed in modern physics laboratories. We don’t notice them in our daily lives, because the effects are only apparent at speeds close to the speed of light. Still unimpressed? Wow, you’re hard to please. OK, what about the possibility of travelling back in time? What if you could change history, go back and find your parents, somehow prevent yourself from ever being born? What would Einstein say about such heresy?